Elope – there could not be a better way to celebrate with the partner you want to spend the rest of your life with. The beautiful weather and Evergreen Garden's exceptional service make this a match made in heaven. It's all about the love and commitment to each other. Elopements take the stress out of such important occasion and what is left is sheer joy! 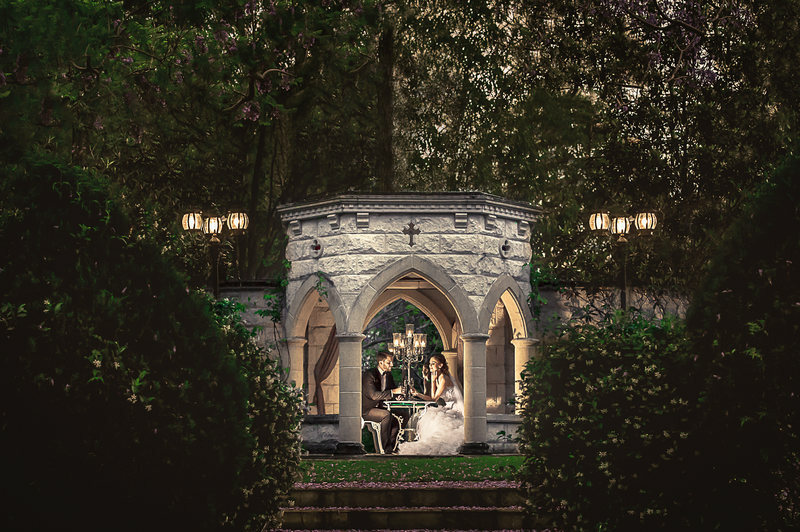 We look after everything for you – have your fairytale wedding in Evergreen Garden and then your spectacular honeymoon on the Gold Coast. Our elopement package caters to those looking for an intimate ceremony for up to 8 people. Celebrate this day privately together or with your loved ones. This day is all about the sharing of two peoples love and commitment to each other. Capture those memories in the beautiful Evergreen garden where everything will be organized for you, so you can relax and enjoy your dream day. Celebrate your intimate wedding in style and privacy in the beautiful Evergreen Gardens. Here in the peaceful, secluded garden you can marry the one you love and then celebrate with your own private, elegant reception. This package is available Monday to Thursday and includes Venue, Celebrant, Florist, Photographer, Catering, Non- alcoholic beverages and Styled Reception,everything except your wedding cake and if you would like we can arrange that for you too. Everything is arranged to the finest detail: Flowers are delivered, tables are set, private chef is preparing, photographer is ready, celebrant poised and the background music sets the scene. It’s your wedding day! Private coach to bring your guests to and from venue. We can arrange a personalized package for you that may include celebrant, florist, catering, hair and makeup, photography, videography, limousine, harpist, massage, airport pickup, and any detail that you may consider. Our integrity guarantees that we have found the best suppliers in their field and only the best will do for the guests of Evergreen Garden. Our dedicated team will ensure that this will be your dream come true. Elopements are available Monday to Thursday, all year round. Everything at Evergreen was perfect for our elopement! We aren't traditional in any sense so it was amazing how we were totally accommodated for! We made our booking at evergreen completely online, had never seen evergreen until the day as we are from Melbourne, and had only spoken to Marina via email. We were blown away by how amazing it is in person - it's even more beautiful than in the photos! Marina and John are the nicest people you could ever meet and we are so happy they were a part of our day. They are full of positive energy and looked after our every need and requests! We used their recommended celebrant, photographer, florist, and hair and makeup artists - all of them were amazing people, great at their jobs, reliable and made our elopement beautiful. We cannot thank you enough Marina and John! Exceptional service from our first enquiry though to last minute additional needs. Coming from Melbourne and planning a wedding from interstate was a little scary at first, but from my first phone call with Marina I knew we had chosen the perfect venue/host. Marina had everything under control. Attention to detail was above & beyond our expectations. Marina's professionalism and warm and caring nature towards our wedding day and the beautiful grounds of Evergreen garden venue, made our wedding day feel like a magical fairytale beyond our wildest dreams. I will feel forever grateful to Marina & John for all their work that went into making our special day a dream come true. We traveled with our family from Adelaide and could not have been more thrilled with the beautiful venue and garden. Marina was amazing in organizing the most wonderful people for hair,makeup,flowers Photography and delicious food. On the day everyone was so supportive and friendly, it ran like clockwork. Thank you again to Marina and her husband for the most perfect day. We traveled from interstate for our wedding day. The team at Evergreen Gardens couldn't have made our day easier! Marina was prompt and professional in all communications, she put my bride and I at ease with her polite and easy going nature and was an absolute pleasure to deal with in all aspects. The venue is incredible and kept to a pristine standard. All of our guests could hardly believe their eyes upon walking through the gates at Evergreen Gardens. The team were also fantastic at running the show behind the scenes. As you will find out, on your wedding day you don't have the brain space to be directing every little movement during the ceremony. This is precisely what the Evergreen team do for you and you won't even notice it at the time. This all culminated into a perfect wedding day for us which I sincerely thank Evergreen Gardens for.